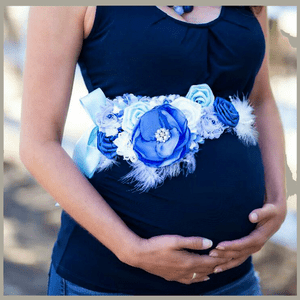 An arrangement of flowers consisting of different textures and sizes makes this sash what it is. This sash would be the perfect compliment to add to a wedding dress, maternity, dances, or photo shoot. It can be used more than once. We can also make custom matching headbands, garters, and corsages. Look past it's one time use, this can be used as table and wall accents, room decor and more! We accept custom requests for sashes. Any custom sash would be unique and one of kind and may not match the picture above exactly. Still well worth it. Send us a message with your custom requests.